SACRAMENTO, Calif. (CN) – A decades-old effort to restore water and salmon to California’s second largest river is on the chopping block under a proposal by House Republicans to speed up dam projects and increase diversions to farmers. The legislation would override federal and state restoration projects on the San Joaquin River as well as allow for increased pumping of California’s vital water source, the Sacramento-San Joaquin River Delta. It would limit safeguards for Chinook salmon and other species protected by the Environmental Species Act and diminish water deliveries to wildlife refuges during drought periods. Backers, including author Rep. David Valadao, R-Hanford, say the plan simply restores access to water for Central Valley cities and farmers that have yet to recover from California’s recent historic drought. The Gaining Responsibility on Water Act, or the GROW Act, has gained the support of California Republicans including House Majority Leader Kevin McCarthy of Bakersfield and the state’s powerful agricultural lobby. In a mostly party-line vote last week, the House approved the proposal and advanced it to the Senate. With the bill gaining traction in Congress, California’s Democratic leaders and environmentalists are uniting against Valadao’s ambitious plan. Prior to last week’s House vote, California Gov. Jerry Brown sent a letter urging House Speaker Paul Ryan to shelve the bill, calling it an intrusion of the state’s water rights. “Making decisions requires listening to and balancing among the needs of California’s nearly 40 million residents and taking into consideration economics, biodiversity, and wildlife resources. All of this is best done at the state and local level – not in a polarized political climate 3,000 miles away,” Brown wrote. California Sens. Kamala Harris and Dianne Feinstein vowed to fight Valadao’s effort. 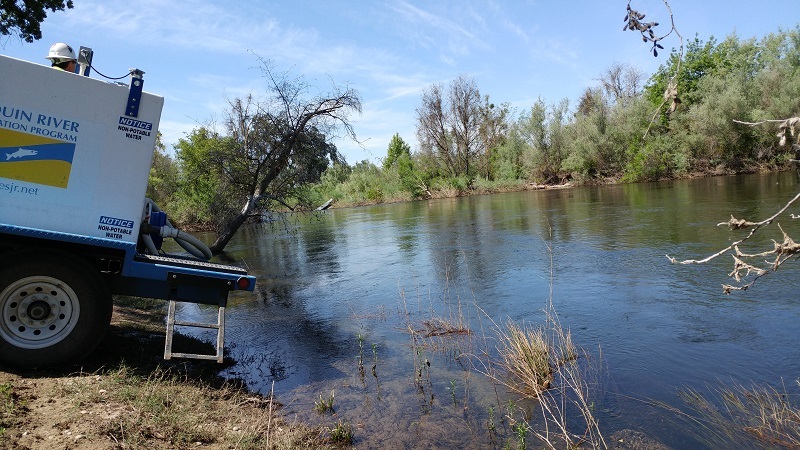 The plan directly threatens the San Joaquin River Restoration Project, which was created in 2006 following an 18-year federal lawsuit brought by the Natural Resources Defense Council. Per the parties’ settlement, the federal government agreed to restore flows and salmon to stretches of the river that routinely run dry due to mismanagement. The project, estimated to cost over $1 billion by the time it’s complete, is well under way in California’s farming heartland. Experts and conservationists call the method of returning extinguished salmon species to such a large river unprecedented. In May, project coordinators met a major milestone by releasing adult spring-run Chinook salmon born and raised in the river back into the system for the first time in nearly a century. The combined efforts by state and federal fish agencies to return salmon to the river would be killed by the GROW Act, critics warn. Coming off a winter that delivered record rainfall and drought relief to much of the state, House Republicans and farmers claim California should focus on finding new ways to capture and store water. They argue millions of gallons of water that could have been used by humans washed out to the Pacific Ocean this winter because California refuses to make progress on a series of dam proposals. The legislation would transfer power over environmental reviews of water-storage projects to the federal government in hopes of fast-tracking new dams. Rep. Doug LaMalfa, R-Richvale, says water infrastructure projects have been “trapped in bureaucratic limbo” for years. “This bill would require the federal government to expedite the process of approving and completing water projects,” he said after voting for H.R. 23. Despite the House’s support, the 134-page water plan faces an uphill battle in the Senate – where it needs the support of at least eight Democrats. “If this bill passes the House of Representatives, we will fight to defeat it in the Senate,” Harris and Feinstein warned.